Our therapy team works closely with you, your family, your medical professionals, and other interdisciplinary team members to develop goals for your rehab stay. We offer treatments 6 days a week with the same therapy staff to ensure continuity in your treatment plans. Being a not-for-profit facility, our staff are committed to providing the best care possible and proud of the many services and amenities available to residents and family members of the Odd Fellows Home. We have four private rehab suites available, as well as semi-private room options. Our Rehabilitation department offers water therapy at our heated indoor pool on the Odd Fellows campus. We also offer the Omni-VR, the only virtual rehabilitation program available in the Walla Walla Valley. Those that have been affected by a stroke or other illness may also benefit from our progressive self feeding program. This program is facilitated by our Occupational and Speech therapy staff and carried out by one of our rehab aides. Therapy modalities available include Ultrasound, Electrical Stimulation, Diathermy, Omni-VR, Omnicycle, Nustep, and Treadmill. Physical therapy focuses on the larger muscles in your body, strength, endurance and balance to improve your ability to perform activities independently. Our Physical therapist, Carolina Sbodio, will meet with you after you are admitted and set up an individually designed plan to help you meet your goals in returning to your prior level of function. Your rehabilitation program may take place in the rehab room, wellness center, swimming pool, or other locations throughout the facility that resemble real life situations. Occupational Therapists focus on the fine motor functioning to increase your ability to function independently. Our Occupational therapist, Barbara Morford, will work with you to tailor a program that will allow you to more safely perform activities of daily living, such as hygiene, grooming, dressing, toileting, bathing, and self feeding. Speech therapists work with a wide range of patients and assist with helping diagnose and treat patients with speech, language, cognitive-linguistic voice, and swallow disorders. Some conditions our speech therapist works with include: Alzheimer’s or other dementia, Parkinson’s, Aphasia, Stroke, Brain Injury, swallowing difficulties, and hearing issues. Our Speech-Language Pathologist, Erin Hawkins-Armijo, is also Vital Stim Certified, one of the only therapists in the Walla Walla Valley that provides this treatment. In addition to working with our rehab patients, Erin also teaches classes through our Wellness Program, including communication, high level cognitive functioning, and problem solving. Our Restorative Therapy Program is part of the overall clinical program at the Washington Odd Fellows Home that focuses on endurance, mobility and movement after our residents have concluded skilled therapies. 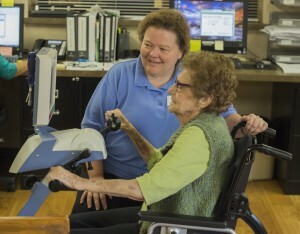 All of our residents are maintained on an exercise program that is carried out by their rehab aide. Additionally, our rehab aides have been trained by the therapists to assist in our specialized progressive self feeding program. Group programming is also offered through our Wellness Program. Keith Keyser, COTA, offers a variety of classes such as chair exercise, balance classes, and Tabata training. Erin Hawkins-Armijo, SLP also offers classes to help maintain cognitive functioning and communication.